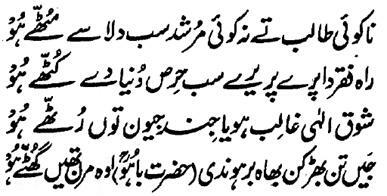 Hazrat Sultan Bahu Rahmatu-Allahe Ta-aala Alaihe says that 'this is a time which lacks the True-Seeker as well as Murshid-e-Kaamil. Only the customs and formalities and childish commitments have left in the Murshideen and the Seekers. Destination of Faqar is well beyond their approach as all these people are greedy and seekers of Dunya (World). Those people, whose heats are dominated by the Fervor of the Jazba (mystique and emotion) Lord, they dislike this world and the life of the world. Moreover, when the fire of the Ishq of Lord rises high in their hearts, they become ready to die and death becomes their true desire.